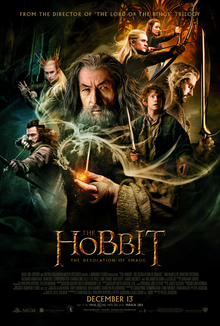 I've now seen The Hobbit (part 1) in both 2d at the Hastings Fleapit and 3d at the BFI Imax. In 2d the only real complaints I had were that the font used for the film titles and credits hadn't been rendered well - it was all pixelly - and that the font used for subtitles when characters were muttering in Tolkienish was crap. Both of those are fixed in the 3d version. Unfortunately, some other stuff got broken. In those long sweeping shots with lots of movement that Peter Jackson loves so much, everything is just a little bit blurry. Even when there's not much movement, such as in close-ups, it's not quite as crisp as it should be. I believe that this is down to how the 3d system works: the images for the left and right eye are projected slightly offset from each other, and polarised 90° apart. The cheap n nasty plastic glasses you get to wear are polarised so each eye sees the right image. Trouble is, everyone's eyes are slightly different distances apart, and so it's only a very lucky few whose eyes are exactly the right distance apart who will see clearly. A handful of scenes and shots definitely benefitted from 3d, but only a handful. I'll not go out of my way to see a film in 3d again, and nor should you. 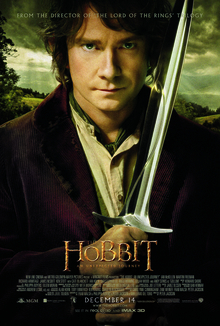 You should see The Hobbit, but seeing it in 2d is fine. As promised, I've now watched the hateful new Star Wars films so I can compare them to the originals while they're still fresh in my memory. The Phantom Menace isn't as bad as I remember, but it's still pretty goddamned awful. There is no acting in it whatsoever, there's irritating expository dialogue (delivered woodenly, of course), there's whole sections that could be cut out or at least severely curtailed. And all the CGI just makes me cross. There is a good film in there, wanting to get out, and it might have been able to get out if the actors had had a chance to act and if there had been a good dialogue editor. But then, having weird and wonderful beasties and lots of stunt flying makes it easier to sell toys and video games. The second prequel, Attack of the Clones is just as ineptly directed and shot. There are a few moments of acting - Hayden Christensen momentarily portrays a wonderfully spoilt and sulky teenager, for instance - but otherwise all the same criticisms apply to this film as to its predecessor. And you can then add a whole load of tired cliches, in particular during the oh-so-derivative rolling-in-a-meadow scene. And as for selling toys and video games - Lucas couldn't even be bothered to shoot the video game footage seperately, it seems. Much of the CGI is of such poor quality that it only belongs in a video game and not in a film. When it comes to special effects, the rule is "Do, or do not. There is no try". Again, there's the potential for a reasonable film in there, shamefully spoilt by how the damned thing was made. And finally Revenge Of The Sith - by far the strongest of the three prequels. The special effects are still short-bus special: many are spectacular, but the rendering especially of the clone troopers is inept. It surely can't have been beyond Lucas's budget to have a few costumes made and use them at least for those in the foreground and interacting with the other characters! Again, it smacks of being a video game in some of the long action sequences. The script and much of the delivery is still terribly wooden, in particular Palpatine's speech in which he takes dictatorial power just isn't written very well. There are, again, moments of acting. Ian McDiarmid really stands out, and Christensen manages to act for a few brief moments. Even so, much of the dialogue is still delivered woodenly, because of over-use of green-screen techniques. To summarise, none of these films are as awful as I had first thought when I saw them a few years back. They're still badly made, but if you can look beyond that you can feel that there is good in them. The common failing is over-use of technology. Lucas supposedly held off from making these films for twenty years to wait for technology to catch up and let him "realise his vision". Trouble is, much of his "vision" could have been done back when the original trilogy was made. Not all of it, sure, but almost all of it could have been, and many of the bits that would have been tricky are peripheral to the plot. The character of General Grievous, for example, in Revenge of the Sith, was clearly designed with CGI in mind, but could have been re-written as a more conventially shaped character and portrayed by a bloke in prosthetics and costume - or could have been written out and replaced with more of Anakin being turned to the Dark side, which in the film did happen rather suddenly and all at once. I've just re-watched all three Star Wars films. The original versions, not the "Special Editions". These were the Laserdisc releases, transferred to DVD by a nice man. Now, Mr. Juan Lemon says that I hate the three modern imposters because I'm watching childrens' films with jaded cynical adult eyes, whereas the originals, while also being childrens' films, are part of my childhood and so I forgive them. Having watched them again, I don't think he's right. The originals are much better films than the imposters full stop. The scripts are better (even the slightly ropey second one); while lots of the dialogue is cheesy, true, it's well-delivered and is actually funny; the editing is first class; the acting is - well, it's acting, instead of people woodenly delivering their lines. I'm sure that the fact that there were people in the monkey-suits and actual sets instead of nothing but a green screen and the aliens would be CGIed in later has a lot to do with that. The models used for the space combat sequences remind us all how far CGI still has to go: the battle between the two fleets near the end of Return Of The Jedi has yet to be bettered by spotty oiks with expensive PCs. Most of all, the films all tell a reasonably coherent story and there is real character development. That's not to say that the films are perfect, of course. All have their flaws. Star Wars is perhaps a little "bitty", The Empire Strikes Back, the weakest of the three, doesn't have a particularly satisfactory conclusion, and Return Of The Jedi has Ewoks (which were apparently going to be Wookies originally but were changed to make a somewhat dark film dealing with issues of good vs evil and redemption more kiddy-friendly). But they're still better than the later abominations, which seem to exist solely to show off Industrial Light and Magic's clever computer tech and to milk the toy market. But now, I suppose, to be fair to the Abominations, I do have to watch them again. I'm not looking forward to that. Set during and in the decade after the Chinese civil war, the film is based on the true story of a war hero fighting for the honour of his company, who despite fighting to the last man to cover the retreat of their regiment, were listed as Missing In Action instead of killed by the enemy. It is well-written (and well-translated and subtitled too - including, amusingly, a few lines in English spoken by a Yankee tank commander during a scene set in the Korean War), well shot, has an especially good musical score, but is perhaps a little let down by the acting - although I'm sure it doesn't help that I was having to read subtitles instead of just watching. The lead character Gu Zidi is particularly sympathetic, as is his company's political officer, but the rest are somewhat one-dimensional. Overall, the story is touching, and that it provokes an emotional response shows that it's Good Stuff. Recommended. Another "homage" (mis-pronounced, no doubt, "omarj" in an attempt to sound all French and edumacated) to Seven Samurai, this is just as bad as the original. It was originally supposed to be 240 minutes long, but was cut to just 150, which may go part way to explain some of the jarring jumps and gaping plot-holes. These would make it an even worse film than Seven Samurai, if it wasn't for the fact that at least it's fairly well shot. There's also some ridiculous martial arts action, which always helps. The dude with the killer umbrella raises this up to getting three stars, just about. This is, apparently, a great masterpice, and "unanimously hailed" as such according to one reviewer. Nonsense. While it does have its good points and has been undeniably influential, it's not actually a very good film by modern standards. It's not helped by being too long to support its story, and by too many cuts between pointless short shots when nothing is happening. I really wanted to like this, but I couldn't. The story, modulo a few details and one extra sub-plot in this remake, is pretty much identical to that of Seven Samurai, even down to some of the dialogue being almost the same. Unlike the original, however, The Magnificent Seven is a film that everyone should watch, and which you will enjoy. It is much shorter, with many of the pointless slow bits left out, is better lit and shot, and is by far the better film. Highly recommended. The lovely Mr. Juan Lemmon reminded me that I need to review Shark In Venice. This is Not A Good Film. It's vaguely enjoyable, once, while drunk, but it lacks quality, in pretty much all departments. This can sometimes be forgiven - I forgive the makers of Mega Shark vs Giant Octopus, because their film is so delightfully over-the-top, cheesy and stupid. Trouble is, Shark In Venice doesn't hit any of those. It's not particularly OTT, at least no more so than an Indiana Jones film; it's not cheesy, taking itself quite seriously and it's obvious that quite a lot of money was spent on it; and it's not even stupid - it's ostensibly no more brainless than a thousand other, better films. If only the film-makers hadn't taken their job so seriously they might have produced something that's actually fun. But no, by being so earnest, they merely emphasised their own incompetence. Brighton Wok: not very good, but great fun and recommended if you appreciate amateur film-making. The Warlords: great - Chinese cinema is really very good these days, even if it is still somewhat one-dimensional, with most of their films (at least of those that ever make it to the West) still being some species of martial arts or war movie. House of Flying Daggers: good, but not great. The second half drags a bit and the plot goes through some rather silly contortions. Worth watching all the way through though. Turn your brain off, because there's no art here, precious little story, some really bad effects (and some really good ones, which make the bad ones even worse), so-so acting. That sounds exactly like a review of Starship Troopers doesn't it. I loved starship Troopers. And I loved Mega Shark vs Giant Octopus too. In amongst all the cinematic gourmet meals on my DVD shelves, this is a gigantic burger with loads of gherkins, and both ketchup and mustard. And I don't care that it's bad for me. Update: 2 Sep 2009: it has been brought to my attention that I may have to add a disclaimer that my review of this film was influenced by drugs. Namely two bottles of wine. Who wants to come and see Taking Liberties, a film documenting just how nasty New Labour really is, at the Curzon on Shaftesbury Avenue? Leave a comment, filling in your email address, and I'll try to herd the cats. My own preference is for the Thursday evening showing, at 9pm. Update: Geeklawyer and I are indeed going to the 9pm showing on Thursday the 14th. We're meeting for pre-cinema drinks at the Crown and Two Chairmen on Dean St. We will graciously permit you to join us. I have for a long time espoused Dave's Rule Of Film-Making. Following on from my brilliant Young Hitler film idea, someone should also make Alice In Fatherland. If we can have films like Young Einstein and Young Frankenstein, and a TV series about Young Indiana Jones, why has no-one made Young Hitler yet? Furry snakes (fake fur too, yuck) with cats' heads were menacing trains going through Purley, jumping on board and killing the passengers. At some point the dream switched to looking like it was shot on 16mm black and white film, and when I looked out of the window of the train I yelled "continuity error!" cos the view outside was looking down the side of the train instead of out at the fields. The ticket inspector reassured me that it had been done for dramatic reasons and I shouldn't worry.